The Tribune Tavern closed after the tower’s new owners wanted $121,000 for maintenance costs. Shortly before the Tribune Tavern restaurant and bar closed in October, the new owners of the Tribune Tower asked the restaurant's managers to pay more than $121,000 in maintenance costs, effectively forcing the restaurant to close and wresting control of the ground floor space from the building's former owner, according to newly filed court documents. The termination of the restaurant's lease is the latest domino to fall in a business empire once controlled by Thomas Henderson, the tower's former owner who was sued by the U.S. Securities and Exchange Commission a year ago for allegedly defrauding hundreds of foreign investors out of millions of dollars. The iconic Tribune Tower was placed under court control in 2016 as part of a separate lawsuit against Henderson. A court receiver sold the tower in December 2016 to Emeryville-based real estate company Harvest Properties for $20.4 million in an effort to pay back investors. Since then, Harvest Properties has been working on renovations to the building, including a lobby upgrade and seismic improvements. But the Tribune Tavern — of which Henderson controlled 75 percent — remained in the building under a lease that Henderson had effectively negotiated with himself when he still owned the tower. The lease was set to expire on March 31, 2018, but the Tribune Tavern had options for two five-year extensions, setting rent at $8,450 a month until 2023 and then rising to $9,500 a month until 2028, provided the restaurant still occupied the space. The original lease took effect on April 1, 2013, and set the Tribune Tavern's rent at $7,500 a month, but Henderson admitted in a 2016 court deposition that the restaurant paid no rent for about three years because it was not turning a profit. Restaurant manager Robert Soviero discovered last year that Henderson had not paid state payroll taxes either and the state had placed liens on the business for $20,000, according to court filings. Neither Soviero nor Harvest Properties responded to requests for comment. Copies of the Tribune Tavern's lease, operating agreement, and other records were included in court filings in the ongoing federal fraud lawsuit against Henderson. Last month, the SEC reached a tentative settlement with Henderson mandating a consent decree, but the deal still requires final approval by the SEC and U.S. District Judge Richard Seeborg, so its terms have not been disclosed. The SEC accuses Henderson of defrauding investors seeking visas through the EB-5 visa program, which grants foreigners permanent residency in the U.S. in exchange for a capital investment of $1 million — $500,000 in areas with high unemployment — that leads to the creation of 10 or more full-time jobs. The program has exploded in popularity in recent years, with $3.82 billion invested in 2016, according to a report by financial adviser Brandlin & Associates. The program has even been used by companies associated with White House senior adviser Jared Kushner. According to a recent Bloomberg investigation, Kushner's sister, Nicole Meyer, appeared in Beijing last year to recruit investors for a Jersey City development project by Kushner Companies, at one point using an image of President Donald Trump during a presentation. Reports of the Chinese company, Qiaowai Group, claiming a relationship with the White House prompted U.S. Sen. Chuck Grassley, R-Iowa, to call for an investigation by the SEC and the U.S. Department of Homeland Security. According to the SEC, Henderson used slick marketing campaigns to recruit investors, primarily from China, and convince them that investing in his companies would create jobs and get them green cards. The SEC alleges that Henderson would then move the funds into unrelated companies, purchase real estate, or spend it on himself. Henderson's first EB-5 venture in the East Bay involved a skilled nursing facility in East Oakland under the direction of an experienced administrator, Shirley Ma. But without informing Ma, Henderson used $1.3 million of the EB-5 funds raised for the nursing facility to help him purchase the Tribune Tower in December 2011 for $8 million. He planned to establish a call center there. In 2012, Henderson partnered with respected Oakland restaurateur Chris Pastena, who opened the popular Chop Bar in 2009. Pastena and Henderson opened two Oakland restaurants together in 2013: The Tribune Tavern and Lungomare, a high-end Cal-Italian restaurant in Jack London Square. According to the SEC, Henderson invested $3.8 million raised from EB-5 investors in the two restaurants, but did not tell the investors the funds would be used for that purpose. 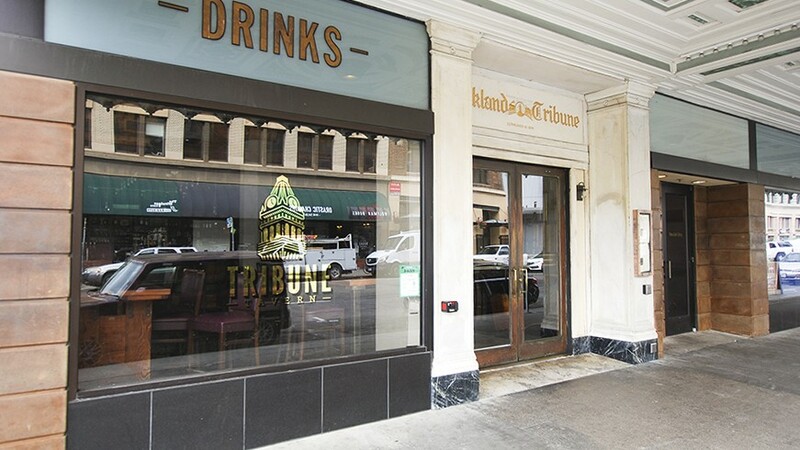 The Tribune Tavern opened in April 2013 to positive reviews. But behind the scenes, Pastena and Henderson's business relationship unraveled. Pastena sued Henderson in August 2014, alleging that Henderson had been concealing financial information from him and was threatening the businesses' profitability by taking expensive complimentary meals and drinks for himself, his family, and potential EB-5 investors. A settlement gave Pastena control of Lungomare and Henderson control of the Tribune Tavern. Since then, the Tribune Tower was primarily managed by Soviero, who owned 15 percent of the business. Another investor, Hung Viet Luong, owned 10 percent and the rest was owned by Henderson, according to court records. Henderson's business partner in his call centers, Allan Young, sued Henderson in Alameda County Superior Court in 2015. Judge Julia Spain appointed Susan Uecker as a receiver, putting much of Henderson's business and real estate holdings under her control. Uecker then sold the Tribune Tower to Harvest Properties. When the SEC sued Henderson in 2017, the federal court appointed Uecker to be the receiver in that case as well and placed more of Henderson's holdings under her control, including This Is There Restaurant Group, the company that owned the Tribune Tavern. Uecker was in talks with Soviero and Luong to purchase Henderson's portion of the Tribune Tavern. But a series of unexpected costs, particularly demands by the new landlords, made that increasingly difficult. First, Soviero discovered that the business owed $20,114.72 in state payroll taxes. Then, as Harvest Properties started earthquake renovations, the company refused to abate the Tribune Tavern's rent to account for the impact it had on the business, despite concerns that construction noise would drive away customers, according to court records. The lease, which was signed by Soviero as the tenant and Henderson as the landlord, did not have any provisions for damages if the restaurant was denied full access or use of its space. In early October, Harvest made a $121,594 claim on the restaurant for common area maintenance expense reconciliation — a charge that typically includes expenses for services like landscaping, trash removal, security, or janitorial services. The restaurant's business had been declining, so Soviero and Luong withdrew their offer to purchase Henderson's portion and resigned from the Tribune Tavern. By the end of the month, the restaurant closed and all the employees were laid off. According to court records, all workers were paid the wages they were due and whatever paid time off they had accrued. Harvest Properties then agreed to waive the maintenance fees. The past due taxes will be paid through the sale of the liquor license, which expected to be worth about $30,000.